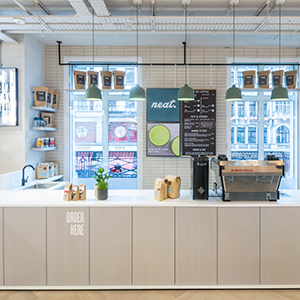 All-natural nutrition brand, Neat, is expanding into retail with the opening of the Neat Café in the brand-new lululemon Regent Street store. The café will serve freshly made ready-to-eat meals, snacks and Neat Nutrition protein shakes plus speciality teas, Ozone Coffee and PRESS Juices. The Neat promise is to keep its product range simple and great tasting, free from chemicals and unpronounceable jargon. Neat focusses on the essential ingredients and has no added sugars, artificial preservatives or fillers that can leave users with a chemical aftertaste. 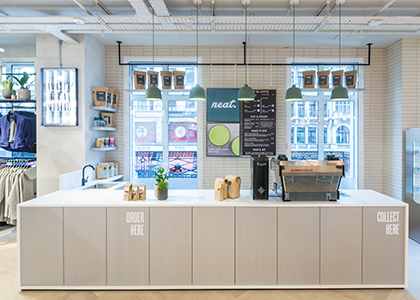 The store, lululemon’s new European flagship, is laid out over two floors; a dedicated Community space – in which the Neat Café is located – is on the first floor, curated to create a relaxed atmosphere that will also host complimentary health and wellbeing workshops and yoga classes.